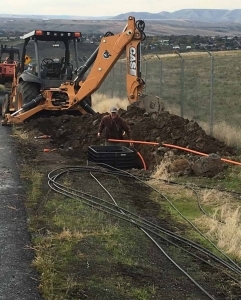 In 2016, the Port of Lewiston began constructing dark fiber optic infrastructure within the Port District to establish an open access telecommunications network for economic development purposes. To date, the Port has constructed approximately 28 miles of dark fiber optic infrastructure including redundant paths across the Southway and Memorial Bridges. The Port’s plan is a phased approach in constructing an open access dark fiber network within the City of Lewiston and Nez Perce County. This network provides a fiber optic highway that is accessible to all service providers on an equal basis. The open access infrastructure encourages free market access to all service providers desiring to offer competitive services. The Port will not offer end user services. Future direction and growth of the network will be determined by the demand within the marketplace based on telecommunications services purchased by local businesses. Why Should the Port get involved? Constructing public infrastructure is what municipal government and Ports do. Building open access fiber optic infrastructure is no different than constructing a public road; instead of moving vehicles, you are moving data. This project is an effort to “bridge the digital divide” and provide an open access highway to any and all interested service providers. Creates an even playing field to all service providers; no need to capitalize systems as public infrastructure will already be in place. Existing local business will benefit from open competition in the market place allowing for more choices and bandwidth. A community-wide fiber optic network is a great retention and recruitment tool to encourage companies to locate or expand in Lewiston. Enhanced availability of services, redundancy and bandwidth to city and county government, K-12 system, colleges, hospitals, libraries and medical clinics. Possible uses include long distance learning, online meetings, tele-medicine and enhanced library services and internet access. 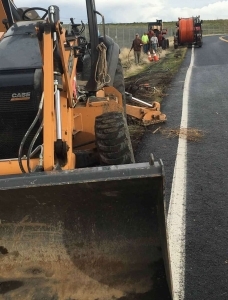 Summit Utility Contractors installing the Port’s fiber optic cable near the Lewiston-Nez Perce County Regional Airport. As of November 2016, the Port had installed approximately 13 miles of fiber optic cable, extending from Memorial Bridge through downtown, to the airport and more.